HANNIBAL – To bolster literacy and improve instruction, the Hannibal Central School District has teamed with area educators, the CNYOC Teacher Center, CiTi BOCES and the highly acclaimed Reading League to launch the Oswego County Literacy Initiative. Members of Hannibal’s literacy team gather for a group photo during an Oswego County Literacy Initiative meeting over the summer. From left are Gale Cacchione, Katie Sojewicz and Sue Morley. 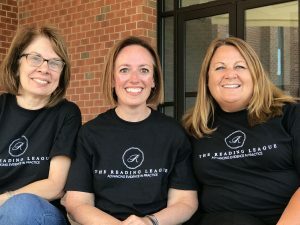 As part of the effort, new reading coach Katie Sojewicz, along with reading teacher Sue Morley and instructional coach Gale Cacchione, will work with teachers and students to implement evidence-based reading instruction. The roll-out began over the summer when the trio met with teachers for a professional development opportunity. They worked with educators to discuss ways to teach reading using evidence-based, highly effective methods of reading instruction and assessment. The data-driven initiative provides teachers with the necessary training and knowledge to help all students become better readers. It isn’t an entirely new method, Froio said. Froio and Fairley Principal Amy Bird said they were looking forward to being part of the collaborative effort. “We’re excited to partner with the Reading League so that we can build a solid foundation of reading skills,” Bird said.